Wait to Measure Until AFTER the Paper is Purchased? I have an appointment to measure and quote a job today. The client just called to ask if it wouldn’t be better if I waited and came out AFTER she has her paper in hand. No, no, NO, people!! 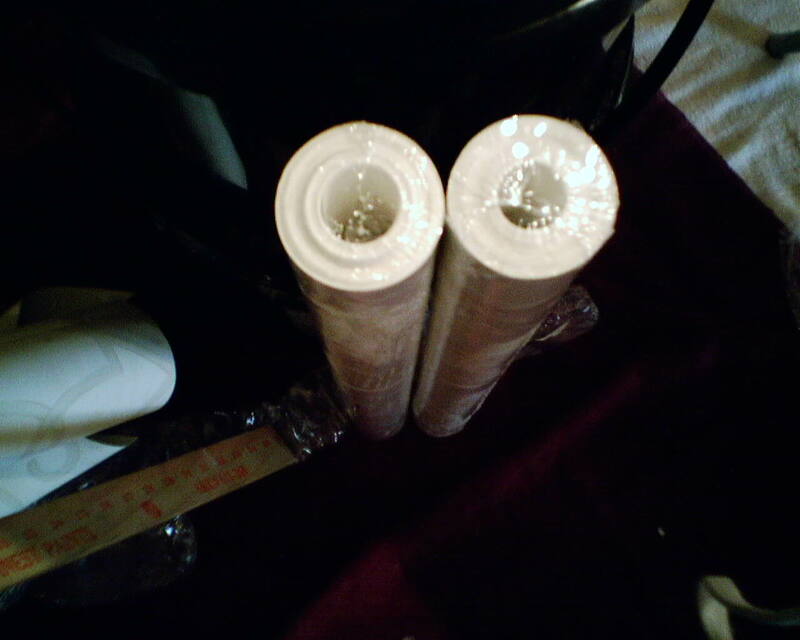 The paperhanger comes out FIRST, to measure and tell you how much to buy!! So many people try to measure on their own, going by something they read in the front of wallpaper books or on the Internet or something someone in the paint store told them. Invariably, about 50% of these figures are WRONG. Measuring for wallpaper is tricky, and goes beyond the square footage of the room, involving factors like room layout, window size and placement, pattern match, repeat,brand of wallpaper, type of wallpaper, on an on. Please, leave measuring and figuring how many rolls to buy to the pros! 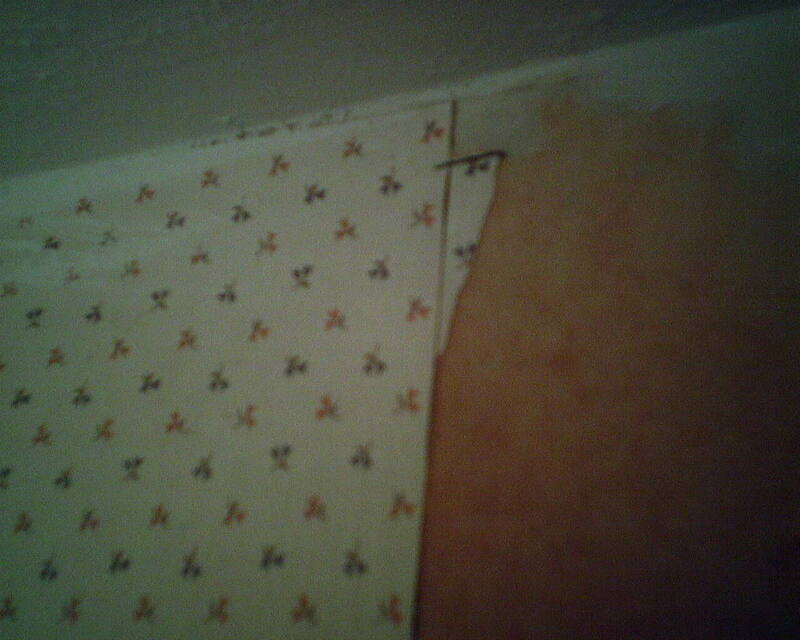 See the difference in these bolts of wallpaper? Although they are both from the same run (printed with the same batch of ink), this scares me, because it makes me wonder if they were rolled up on different machines, which means they could be from different runs. Or if someone returned the paper to the factory because of a defect, and the factory re-rolled them and re-sold them. Yeaaay! Another design article moving people to decorate with wallpaper. In one of their photos, the pattern was subtle, a tone-on-tone overall damask look. Another was a large scale lattice. A third had very large (football-sized) zebras dancing against a chocolate brown background. All of them looked great. I totally agree with the statement about daring to do something somewhat wild in a powder room. I call them “Drama Rooms.” They’re easy to live with in small doses, and when you’re not in the room, you simply close the door and the motif does not interfere with the style of the rest of the home. And it’s amazing how well overscaled patterns work in small spaces. Ditto the notation about the small space requiring less material, so it’s more affordable to decorate a powder room than a larger room. I definitly do NOT agree with the comment about using grasscloth or silk or other fabric in a powder room. True, humidity is not an issue because no one will be showering in there. But water splashing on the walls when someone washes his hands or reaches for a towel will – WILL – stain the paper over time. There are faux grasscloth materials that mimic the look of the real stuff, or, another option is to use a sealer to prevent / reduce staining. Yes, it’s small, and it’s on the back of the York brand wallpaper. But it did show through to the front. It was a black & white stripe pattern, and the spot fell in the black area, but was still visible. If it had been a busier pattern, it would not have been so easily noticed. I ended up using the strip. We had only 4 single rolls to do this potty room in a hall bathroom, and every strip counted. Luckily it was near the end of the strip, and, when placed on the wall, ended up about 3″ from the floor. Not like anyone’s going to notice THAT very easily! I visited another home show today, at the Geo. R. Brown Convention Center this time, and master faux finisher Michael Graves http://www.michaelgravesstudio.com/ did another presentation. An interesting comment he made was that if you want to know what’s current to clothe your walls, just take a look at what’s clothing women in the fashion magazines. He said that interior design fashions (including wallpaper) and clothing fashions follow the same trends, so what’s in fashion in one areana will work in the other areana, too. Oh, really? 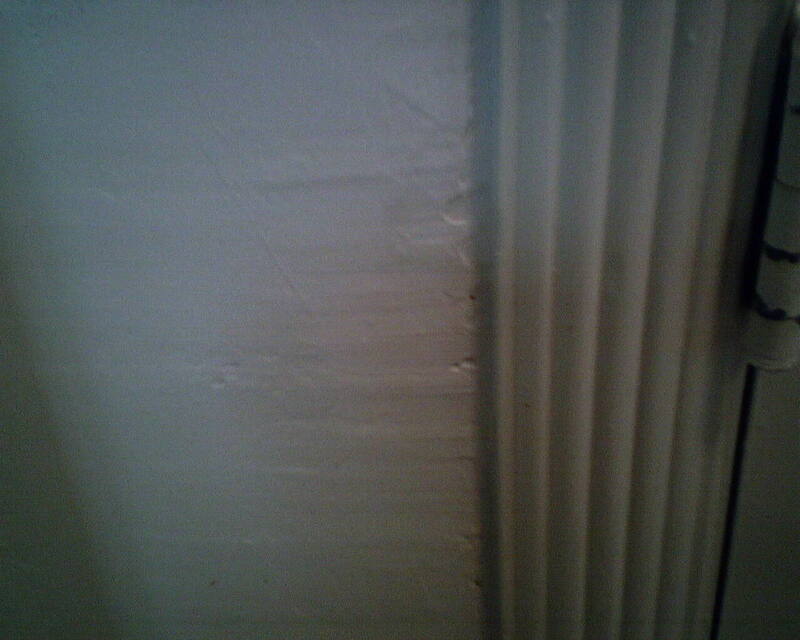 So the painters left the walls like this and told the poor homeowner they were “ready for wallpaper.” NOT! The thinking is, I am guessing, first of all, that many homeowners simply don’t see the unevenness, and trust that their painters know what they’re doing and have done the job correctly. Second, since the wallpaper choice is grasscloth, they’re probably thinking that the coarse texture of the material will disguise these irregularities. Well, that’s partially true, in some cases. But in this case, the selection is a very fine, thin grass fiber, and even small irregularities WILL show. Second, it’s not just what shows on the front that’s of concern; it’s also important to have a smooth surface for the back of the paper to stick to. This is a problem on this particular job, because I had only three days to do the two-room project. The best option would be to completely skim-float the entire space, sand, and prime. But this would have added two days and several hundred dollars more. Not an option. So I spent a lot of time today floating the worst areas, and will have to spend more time tomorrow sanding and vacuuming and repriming. This puts me behind schedule, and leaves about a day and a half to hang 30 rolls of paper. I usually manage about two rolls an hour, so you can see where we’re headed – some really late nights! It was a wasp. 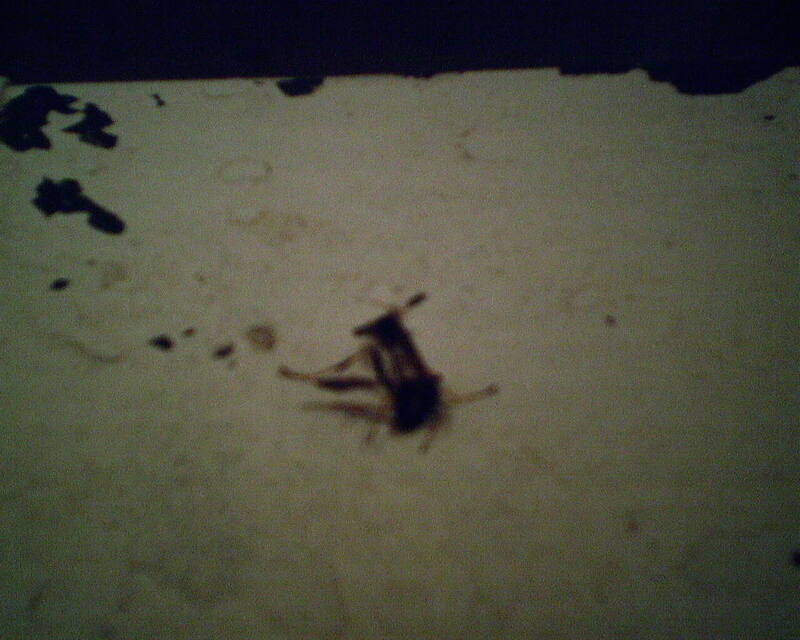 WAS a wasp. Sitting on my dropcloths. Luckily, I saw the guy before putting my hand on the dropcloths. His day ended abruptly and tragically. 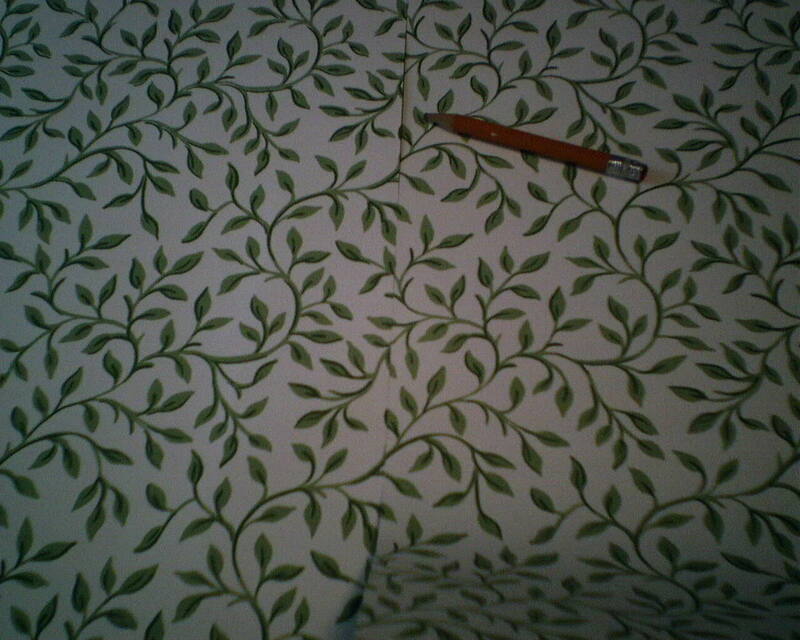 “Pattern repeat” refers to how many inches go by before a design element (in this case, a particular leaf) is repeated on the paper. Depending on the exact height of your walls, a very long repeat can mean you need to buy a lot of extra paper, just to match the pattern. 25 inches is fairly long. A “Straight Match” means that the same leaf is at the top of the wall on every strip. A “Drop Match” means that the leaf drops down the wall 1/2 the distance of the pattern repeat on every other strip. 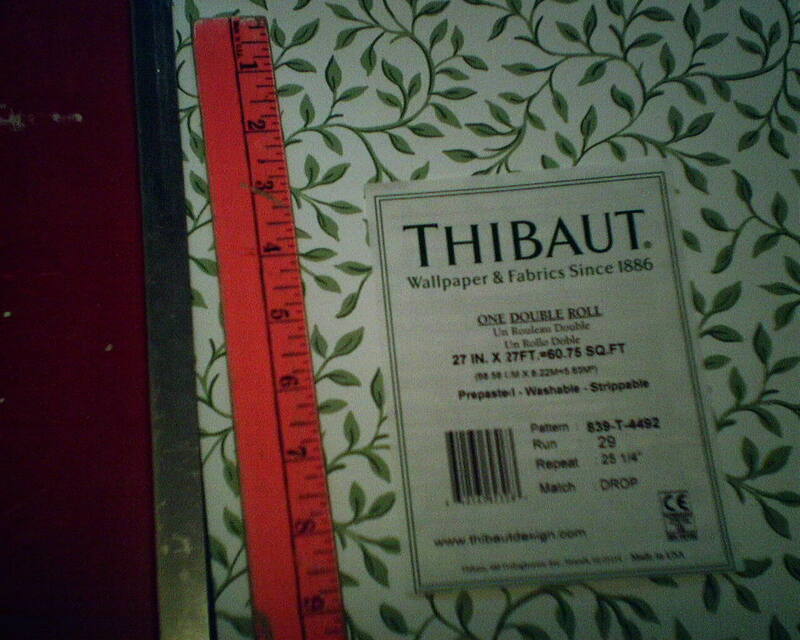 The label on this bolt of Thibaut wallpaper said it had a 25 1/4″ pattern repeat, and a drop match. I took the first photo because, as you can see, the repeat is only 5 inches, and it repeats horizontally straight across, not half-dropped. 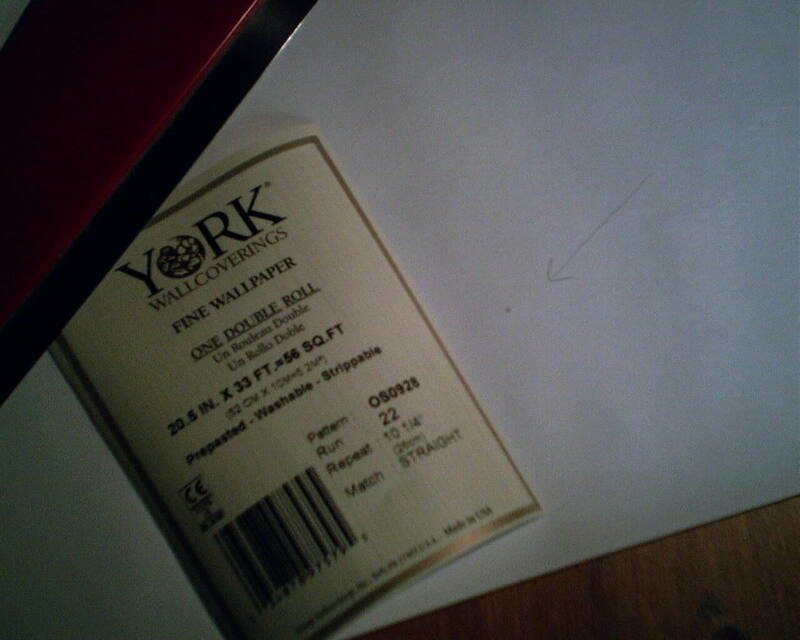 I laid the paper out to see what the pattern match was, as in the first photo. I cut the four strips needed for my first two walls. The first strip went up fine, and the second strip matched perfectly. But the third strip, cut from the same bolt of paper, did not match. It matched in some areas, along some stems and leaves in the pattern, but not in others. See the second photo. (Click to enlarge.) The pattern matches at the bottom, but is off a little at the top of the photo. At first, I thought the manufacturer had miscut the paper. I studied, recut, rematched, rehung, rethought, redid and reflected. Finally I realized that every leaf that LOOKED the same was NOT ACTUALLY the same. Take a look at the second photo. Right by the pencil, see the stem that is curved downward like an upside-down “U” ? Now look below it, and you will see the same upside-down “U” shaped stem. But look closer – it’s not EXACTLY the same! On the upper stem, there are five leaves, and the bottom one points to the left. But on the lower stem, identical in shape, there are only four leaves, and the bottom one points to the right. Also, on the left side of the seam, on the top stem, right at the seam, there is an extra little short bit of stem. On the lower stem, there is none. Man! You have to have good eyes, and a lot of patience, to see that. And it’s important, because even a little mis-match, even on a busy pattern like this, will be noticeable. What I don’t get is, why would the designer make a pattern that is ALMOST the same, but not exactly? To relieve monotony? Naaah. In a busy pattern like this, your eye is not going to notice the tiny difference in one leaf pointing to the right and one pointing to the left. The only reason I can think of is – to eat up more paper. And thereby to SELL more paper. You see, as mentioned above, long repeats can eat up a lot more paper. In this case, I think the long repeat is unnecessary, and a silly thing for the designer / manufacturer to do. When wallpaper starts failing, sometimes people grab the closest sticky thing, to keep the paper from falling off the wall. 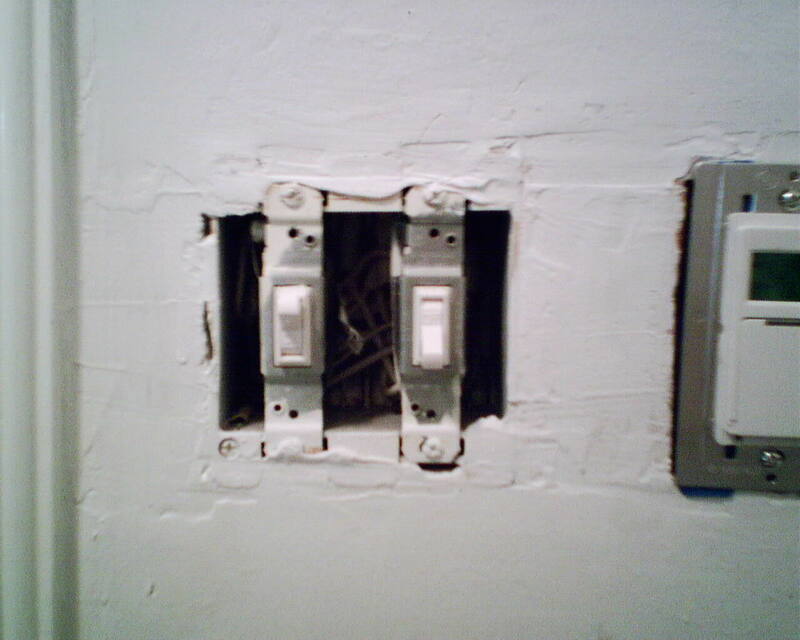 This homeowner tried – STAPLES! You are currently browsing the Wallpaperlady's Blog blog archives for March, 2013.